Tranquility Hill Bonefish Lodge sits atop a low hill near Behring Point, overlooking the eastern entrance to the North Bight, between North and South Andros Islands, Bahamas. It is here that the legendary Ivan Neymour, one of the pioneers of bonefish on a fly, guided for over 40 years, and here that the Mackey and Neymour families have been welcoming anglers with island hospitality and world-class bonefishing since 1996. Tranquility’s hilltop location not only offers a panoramic view across the bight, with wading flats directly in front of the lodge, but also gives anglers easy access to hundreds of square miles of spectacular sand flats, mangrove cays, sheltered bays and winding creeks, all teeming with bonefish. 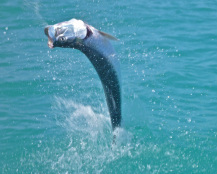 Andros is well known for numerous large bones, with the average in the 3 to 5-pound range, frequent shots at 6 to 9-pound fish, and double-digit monsters not unusual. In addition to sight casting to bonefish you can pursue tarpon, barracuda, sharks, jacks and snappers, and if the weather is calm, make a trip to deeper water for wahoo and dorado. Even excursions to the wild and rarely fished west side of Andros can be scheduled. If you are an expert looking for shots at big fish or a beginner wanting to hook up your first bone, Tranquility is your place. Stay and fish with us at Tranquility Hill on the Andros bights—still one of the most beautiful and prolific bonefish habitats in the world. "Andros is usually associated with bonefish, but I was surprised at the diversity of fishing opportunities that Tranquility Hill has to offer. Flats, backcountry creeks, and inland salt water lakes - all teeming with a variety of fish ready to eat a fly."